Alongside the mercantilist and metrocentic strain in civil philosophy in the 1730s, there was also an anti-imperial and philocolonial strand. This was represented most notably by the Hiberno-Scot Francis Hutcheson’s A System of Moral Philosophy, which he composed between 1734 and 1737, in the period before the anti-Spanish agitations but in the aftermath of the Excise Crisis and the darkest days of Walpole’s premiership. Hutcheson questioned the very foundations in rights of dominium upon which the British Empire rested, and argued that ‘[n]o person or society…can by mere occupation acquire such a right in a vast tract of land quite beyond their power to cultivate’. This denial of the juridical basis on which the British Empire in America was claimed was in its own way as Lockean as that of the author of the Essay on Civil Government, but took seriously Locke’s sufficiency condition for legitimate possession. Hutcheson went even further, and proposed colonial independence should the mother-country impose ‘severe and absolute’ power over its provinces. ‘The insisting on old claims and tacit conventions’, he concluded, ‘to extend civil power over distant nations, and form grand unwieldy empires, without regard to the obvious maxims of humanity, has been one great source of human misery’. David Armitage (2000) The Ideological Origins of the British Empire, Cambridge University Press, p. 188. The book Death and the Irish: A miscellany is “a medley of 75 perspectives on death and the Irish” edited by Salvador Ryan and published by Wordwell. In a positive review Bridget English makes a minor criticism: “Philosophers have certainly shaped the ways that modern secular society conceives of death, yet there are no entries on the relationship between Ireland and philosophy.”1 Philosophers have also referred to death in arguments, and the review brought one particular philosopher and his “deathbed argument” to mind. At Killyleagh during last year’s Francis Hutcheson event, someone asked what the school Francis Hutcheson attended there would have been like. This is an expanded version of the answer given then. In Francis Hutcheson’s day education was officially provided at (Church of Ireland) parish level, with higher level diocesan schools and Royal schools (grammar schools) in each diocese. However in reality many parishes and dioceses had no schools so there were many schoolmasters and schoolmistresses running private schools for pay1. There were also schools providing elementary education associated with other churches. From the age of eight, Francis Hutcheson attended the school associated with his grandfather’s church. It was run by John Hamilton in a disused meeting house near Saintfield, probably in very basic conditions (a later school in the area had a dirt floor and no ceiling). In addition to the elementary education provided, it is likely that Hutcheson’s grandfather Alexander Hutcheson tutored the more advanced students 2. In February 1726 readers of the Dublin Weekly Journal (price 3-half-pence) were seeing something unusual, although they didn’t know it: Francis Hutcheson being sarcastic. In an unusually biting three part essay he lambasted a book called Private Vice, Publick Benefits. In that book the Dutch writer Mandeville argued that vice is necessary to keep a prosperous economy. 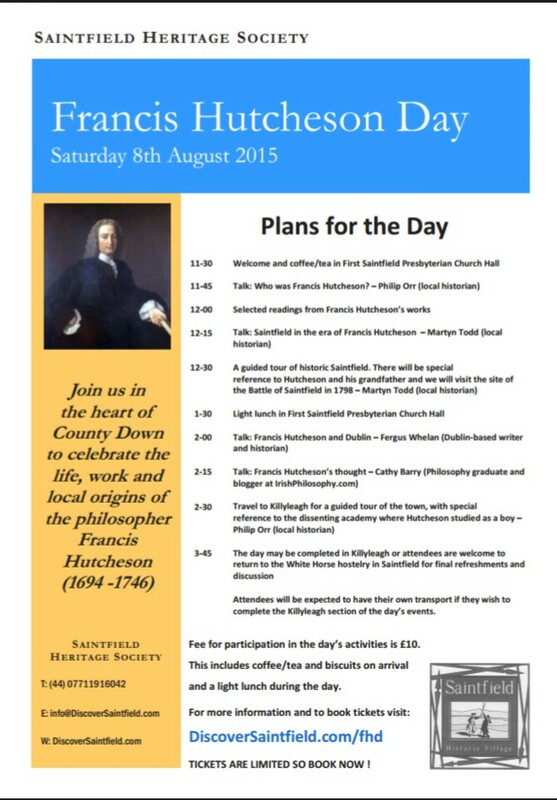 From a talk given on Francis Hutcheson Day (8th August( 2015 at the Guildhall, Saintfield, Co. Down. Full text available on academia.edu. Storify for Hutcheson Day 2015. I came across an article, An image from Francis Hutcheson in Gulliver’s Travels, book IV, chapter 5 by Arnd Bohm, in which he points out the similarity between a passage by Swift and a passage by Hutcheson. The Houyhnhnm is horrified, as we might be well be, at the thought of wholesale death being a “great diversion”. Bohm suggests that the moral indifference shown is emphasised when we realise the likely source of the example Swift is using. The word “empathy” is used in many ways, but here I am adopting its most common meaning, which corresponds to what eighteenth-century philosophers such as Adam Smith called “sympathy.” It refers to the process of experiencing the world as others do, or at least as you think they do. To empathize with someone is to put yourself in her shoes, to feel her pain. Some researchers also use the term to encompass the more coldblooded process of assessing what other people are thinking, their motivations, their plans, what they believe. This is sometimes called “cognitive,” as opposed to “emotional,” empathy.